In my usual routine, I woke up and made breakfast and scrolled through social media. 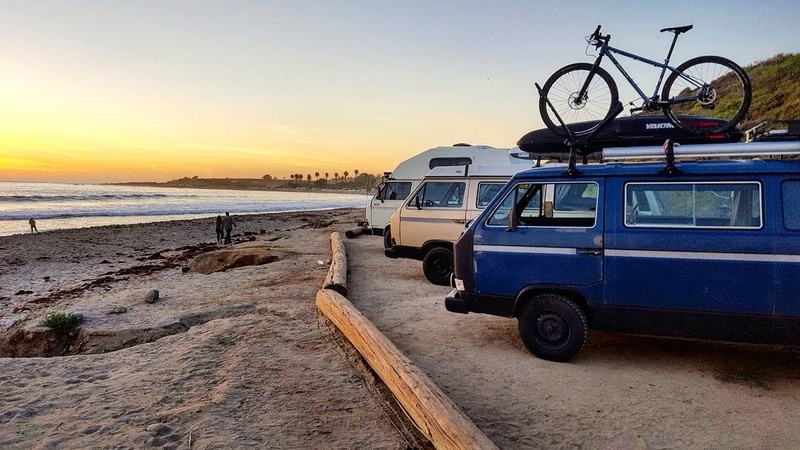 In the Portland Vanagon group, yes, we have a Facebook group dedicated to our love affair with these boxy vans; someone had posted yet another video about the #vanlife movement. After watching it, I felt a bit dirty. Honestly, it is this sort of videos are what give this movement such a bad name. It left me with the need to delve into why I do it – personally. This may be a long post, but you are welcome to come along with me as I think this through in writing. The year was 2011, my girlfriend and I had recently ended our relationship and I was left feeling the need for some life changes. I did not have Instagram at the time, and have no idea whether #vanlife even existed. For me, it was simply an idea for a grand adventure, a chance to get out of Portland and do something that scared me. I had job that allowed me to work from my laptop, so I could do that anywhere. I bought a beat up old Vanagon and started buying parts for an interior. In January of 2012 I quit my other my job and headed down to my Dad’s house to build the cabinetry. Then in February I did it, I left Oregon with little to no idea for how long and only a small idea of where I would go. To this day, that trip is still one of my favorite life experiences. In 2013 I would sell that van, with the plan of simply buying one in nicer condition, but got sidetracked. Three years would pass with thinking about getting a Vanagon again; culminating in a purchase of my current Vanagon in the summer of 2016. At the time I was living in a tiny house out in Terrebonne Oregon, near Bend. I knew when I bought it that I would build it out for life on the road, and would return to the vanlife. This time I think it was simply out of boredom. When I think about my life on the road back in 2012, I think of how much fun I had and how everyday seemed an adventure. There is something very exciting about not knowing where you are going to sleep, or where you are going to go, or who you will meet when you get there. I missed that. To me, vanlife also embodied my belief system, as I know it at the moment, which is that we do not need a big house filled with “stuff” to be happy. In my tiny house of 240 square feet I still had bare shelving, which I would shift other things into simply to make it seem less empty. Enter the new Vanagon. I knew that I could thrive in a smaller space. Why maintain a structure AND a car, when you really only need one? This is the ultimate in simplicity, to me, and I love it. To go a step further, I love that my tiny house on wheels has a solar panel that runs my electronics and fridge. Vanlife is not some new concept. I was reminded by a lawyer down in San Capistrano this winter, while living in my van, that people have been doing this well before I was born. The only thing that has changed is social media has made it easier to find each other, rather than simply meeting in a parking lot. Social media has also taken this romantic idea and cranked it to 11 with beautiful imagery paired with poetic verse about the lifestyle. Maybe this is where it gets dirty, when people stop doing it for the joy of doing it and rather do it as a way to make money or for social peacocking. Where does one end and the other begin though? Are we not all a brand, whether we like it or not? Are we not all advertising in some way, and does it make it perverse that someone be paid? I do have an Instagram account, Facebook profile, and website dedicated to this van. This morning’s video had me pondering why I feel the need to have it. Ultimately, I love sharing my adventures with people, I love slinging the vanlife, and I hope that maybe it inspires others to jump on board. I do not have a problem with the vanlife movement. I once read an article that was talking about where vanlife fell in the spectrum. Whether it was a part of the minimalism movement, the tiny house movement, or any number of other things it could fit into. Honestly, in a time of such glut and needless consumption, I feel like the more people that can live this simply, the better. I have met so many wonderful people through the Vanagon community, and through living on the road. I think what bothers me about it is not the vanlife brand, but rather the use of it as a platform to sell products. It can simply be a home, a home from which you live your life and do your job. If doing your job is selling stuff via pictures of yourself, well, I guess that’s fine too. At the end of the day, there are plenty of people doing jobs that I don’t particularly agree with based on my belief system, that doesn’t make them bad people. So while I don’t love the way things get painted sometimes, it’s important to recognize that it doesn’t really matter how others live their life, so let it go! Thanks for coming along with me as I thought this all through. I wasn’t really sure where this post would go, but it was helpful for me to write it out. So in the end, # Vanlife: It’s not for everyone, but it works for me and it is fine that maybe it’s not for you.